Into the Pit for Repairs - Brigham Young High School students run the wheels off. On a quiet Sunday afternoon in July of 1950, soon after my graduation from BY High, I was working the afternoon shift at the Library Service Station. 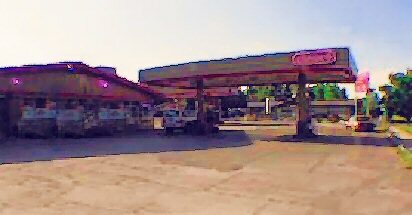 This Conoco station was located on Center Street in Provo. The owner, Jack West, and his general manager, Frank Schooler, decided to leave work early to get in some evening fishing at the lake. They left Hank Stevens and me in charge of the station. Hank was about four years older than me, and largely because of his great sense of humor, wisdom and the fact that he was such a character, he made the Library Station a regular hangout of BY High ne'er-do-wells, which also made it a very fun place to work. Hank was busy in the lube bay servicing a pick-up truck, and I was just finishing with a customer at the island gas pump, when we all heard a loud noise. It sounded like a car crash, and was quickly followed by screams and moans, apparently from the victims. I turned around and saw a huge cloud of smoke billowing from a Buick sedan that had somehow smashed into a nearby cement footbridge. The footbridge crossed an irrigation ditch that ran along Center Street, about 50 yards before the driveway entrance to the station. The commotion brought Hank out of the lube bay, and together we ran to the scene of the accident. It was hard to tell what had happened since three boys were rolling around on the roadside grass, gasping for air and apparently moaning in pain. A fourth was holding his head in his hands, wandering around the car and crying out something unintelligible about his father. We knew these boys and we assumed the worst, so I wasted no time in running back to the station to summon the police and the emergency medical unit. Hank, in the meantime, tried to help as best he could – and to find out what had happened. Since everyone who knew Hank trusted him, he was able to piece things together – and this is the story he related to me afterward. The car belonged to the father of David Young, the person holding his head and moaning in agony. Professor Young taught at BYU, and his son, David, was in his junior year at BY High. 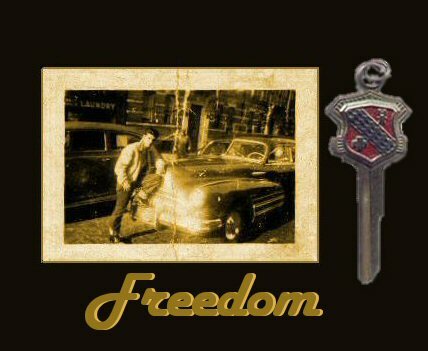 He had borrowed his father’s car (possibly without permission), and had invited a few of his friends along for a Sunday afternoon drive. As the four cruised around the general area of University Avenue and Center Street, they began to pretend that they were in a racecar. Danny Vance was in the front seat with Dave, providing “radio commentary” on the imaginary race. As the Buick approached the Library Station, Danny suddenly shouted, “…AND NOW THE YOUNG CAR TURNS INTO THE PIT FOR REPAIRS!” He expected that Dave would swing the car into the right lane until he could turn into the service station driveway. Unfortunately, Danny’s “command” took Dave by surprise, and he swerved a bit too abruptly. The right front wheel of the car rolled over the edge and dropped into the cement irrigation ditch. The ditch was about 18 inches wide and two feet deep, full of water for the lawns and gardens of people who lived along Center Street. When the front wheel dropped into the trench, the car dropped onto its front axle. The sharp jerk swung the back right wheel into the ditch, too. David was too surprised to hit the brakes, and the car continued its rapid forward movement until it struck the cement footbridge. The impact caused both axles to break, and all four tires blew out. Something under the hood also went awry, sending out clouds of oily smoke and steam. By the time Hank and I arrived at the scene, the car had settled down completely onto its frame within its own cloud. It looked more like a sports car without wheels than a Buick sedan. When the crash occurred, the passengers of the car – with the exception of Dave – rolled out of the car onto the roadside grass, convulsing in laughter. This is what Hank and I initially assumed was the screaming and moaning of victims. A large crowd began to gather. It didn't take long for the police and an emergency medical unit to appear -- trailed by a tow truck. Not much had changed. All participants were still gasping for air in their original uncontrollable states, and Hank and I had joined in their contagious hilarity. Nobody was able to give a very clear statement to the police, but the cops understood enough to give David a ticket for unsafe driving. The tow truck driver dragged the still steaming "unwheeldy" remains off to a collision repair shop. David: Dad, I’m afraid I had a little accident with the car. Professor Young: What happened? Are you alright? Were you alone? Was anyone hurt? David: Well, some of the guys were with me, but no one was hurt. We accidentally ran into a footbridge along Center Street, and the car is at the repair garage now. Professor Young: So what was the damage? David: Both axles are broken, all four tires were destroyed, and the oil pan and radiator were smashed. Hank Stevens says it will take probably take several days to fix. Professor Young: Great Scott, David! How fast were you going? How on earth could you run into a footbridge? Who said you could take the car in the first place? David: Well, it’s kind of a long story Dad. . .
Whatever version of the story David told his Dad, the rest of us have told this authentic tale far and wide. 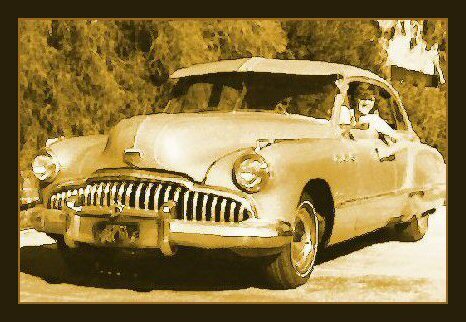 We have never been able to forget the sight of that once-proud Young family Buick, firmly grounded, just as surely as its young Young driver was for the next several weeks.